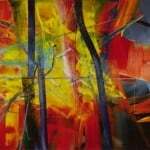 Gerhard Richter is a German painter who originally trained in a realist style and later developed an appreciation for the more progressive work of his American and European contemporaries. Richter increasingly employed his own painting as a means for exploring how images that appear to capture “truth” often prove, on extended viewing, far less objective, or unsure in meaning, than originally assumed. The other common themes in his work are the elements of chance, and the play between realism and abstraction. 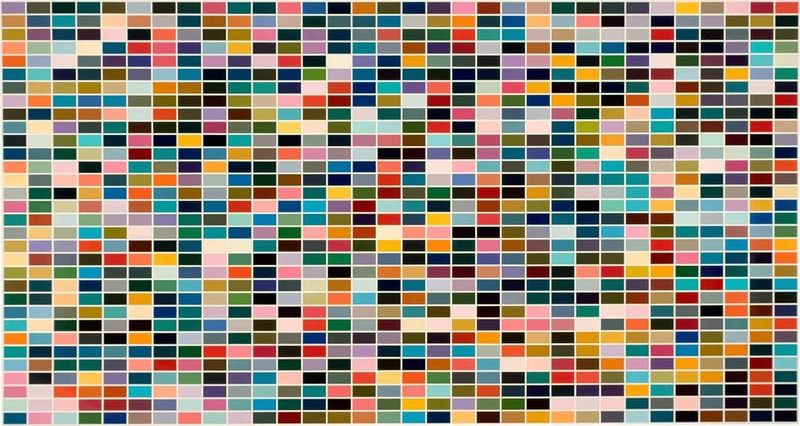 Working alongside but never fully embracing a quick succession of late twentieth century art movements, such as Abstract Expressionism, American/British Pop art, Minimalism, and Conceptualism, Richter has absorbed many of their ideas while remaining skeptical of all grand artistic and philosophical credos. Artwork description & Analysis: Mund is one of Richter’s first paintings completed from a photograph. 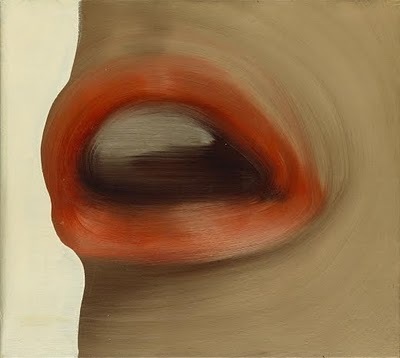 The painting is sexually suggestive, depicting Brigitte Bardot’s open mouth adorned with red lipstick. 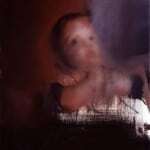 Blurred flesh tones hint at Richter’s painting process, beginning with a realist rendering and incorporating rollers, squeegees, and dry brush techniques to mask the surface. The work suggests the artist viewing reality from a detached perspective, as he resists any moment of clear focus on the overall image. Artwork description & Analysis: In this example of one of his early grey paintings, Richter allows structure and color to compose the “picture.” The painting is void of figuration and recognizable imagery, revealing Richter’s indifference toward any “model” as serving as his subject matter. 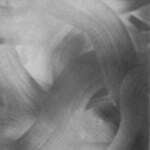 Richter employs thick brushstrokes and monochromatic color, thus sweeping across the canvas in a fluid, entirely fused motion. This powerful gesture suggests a consideration of how abstract forms may well serve as a painter’s subject just as effectively, for their visual or optical interest, as any photographic or “realistic” scene derived from nature, or the “everyday world” around us. 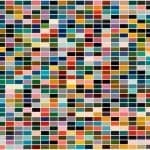 Artwork description & Analysis: Richter employs a systematic approach to the canvas in his color-chart-based painting 1024 Farben (1024 Colours). Superficially reminiscent of the neo-Dadaist, 1950s “Hard Edge” abstraction of Ellsworth Kelly, Richter chooses here to systematically paint squares of colors based on the predetermined structure of the color wheel. The only intervention of the artist in an otherwise mechanical process seems to be his control of the scale of the canvas itself, the artist’s having arranged the color combinations via reference to an apparently logical, predetermined schema. 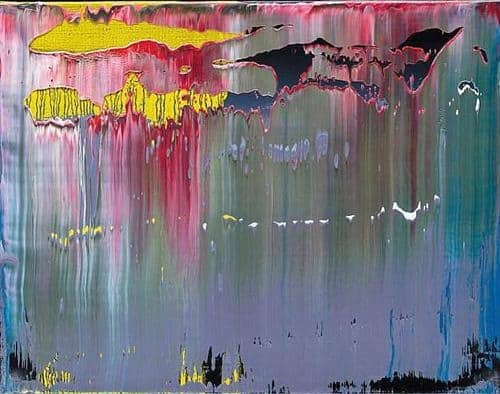 Artwork description & Analysis: In 1976, Richter first employed the term “Abstract Painting” as a formal title for many of his works, such as this example. Cool tones of purple and blue create a hazy, shallow atmospheric perspective. The composition is structured with geometric shapes and lines that might at first appear as fractured icebergs emerging from the painted surface, only to settle down, as it were, into pure abstraction. 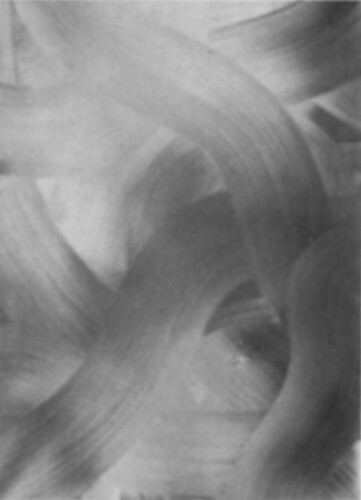 Richter did not want to offer a definitive explanation for his abstract work, stating only that he was “letting a thing come, rather than creating it.” Standing in relation to such work, a viewer begins to question whether what he/she perceives is fact or fiction, real or artificial, as though slowly being trained in a new school of visual philosophy. 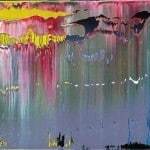 Artwork description & Analysis: Clouds is an example of how Richter frequently alternates between realist and abstract styles in various series of work, as well as on a single canvas. In this instance, even the title bears an ambiguous relation to the entire composition. In the lower region of the canvas, for instance, Richter suggests that the viewer is having a perceptual experience of looking through a window; nevertheless, the bold tracks, scrapes, smudges, and layer of paint above playfully cancel that optical illusion. Thus Richter is frequently fascinated by how a viewer’s desire to extract “meaning” from a given work of art often proves utterly futile. He suggests that we might instead relish a simple experience of visual pleasure, or the discovery of “beauty” by way of studying abstract forms for their own sake. 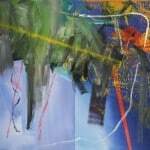 Artwork description & Analysis: For most of his career, Richter avoided political motifs in his work. A notable exception is the series October 18, 1977, in which he depicts radical Baader-Meinhof terrorists who inexplicably died in jail (it remains unclear to this day whether these young radicals committed suicide or were murdered by the police). 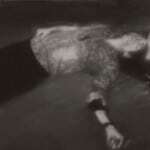 In Erschossener 1 (Man Shot Down 1), Richter has used a photographic reference to create a blurred, monochromatic painting of a dead inmate. The morbid scene might be said to exemplify the vanity behind the terrorists’ actions; at the same time, the persistent obscurity of the image replicates the eternal mystery behind the inmates’ deaths, as well as the impossibility of securely capturing truth in any one canvas. Artwork description & Analysis: In a series of completely abstract works of the early 1990s, Richter challenges the eye of the viewer to detect anything in the field of vision other than the pure elements of his art: color, gesture, the layering of pasty materials, and the artist’s impersonal raking of these concoctions in various ways that allow chance combinations to emerge from the surface. Richter suggests only a shallow space akin to that of a mirror. The viewer is finally coaxed to set aside all searches for “content” that might originate from outside these narrow parameters and find satisfaction in the object’s beauty in and of itself, as though one were relishing a fine textile. One thus appreciates the numerous colors and transitions that occur in this painting, many having been created outside the complete control of the artist much as nature often creates wondrous optical pleasures partly by design, and partly by accident. 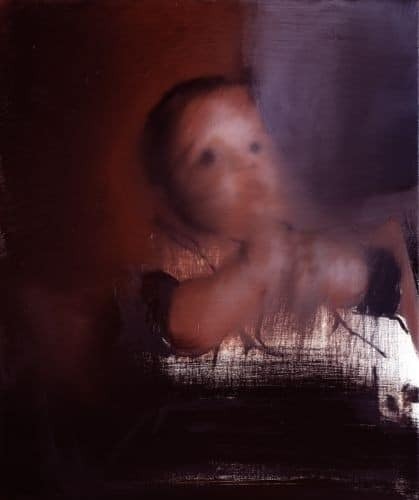 Artwork description & Analysis: Ostensibly a painting of his young son, Moritz exemplifies Richter’s affinity for striking a tense balance between abstraction and figuration. This painting is a hybrid, seemingly fluctuating between two contrasting, unfinished areas, one section realistically rendered (in part harking back to Richter’s Social Realist education), the other fading off into ethereal “white noise.” Moritz is reminiscent of Andy Warhol’s combination of appropriated imagery and painted silkscreen techniques; a hazy glow seemingly emanates from the young boy, thus providing a powerful contrast to the material reality of the painted surface. Richter has maintained a lifelong fascination for the power of images and painting’s long, uneasy relationship with photography: while either medium may claim to reflect or express reality truthfully, either ultimately suggests only a partial, or incomplete view of a subject. Richter would often blur his subjects and embrace chance effects in his own painting process in order to show the impossibility of any artist conveying the full truth of a subject in its original condition. Such means for suggesting that something essential to the model has been “lost in translation” often leads a viewer’s attention to the oil pigment’s dense, material nature, thereby demonstrating both its expressive strengths and shortcomings. 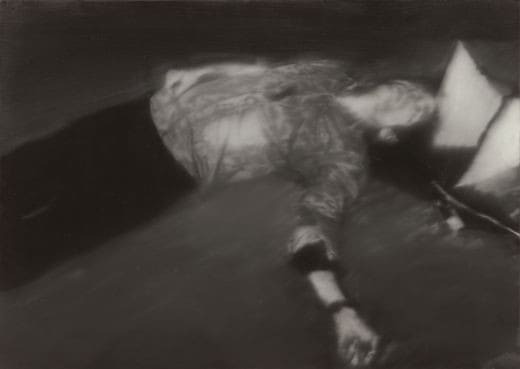 In Richter’s completely abstract canvases, personal emotion and all traces of the painter’s autobiography seem missing. 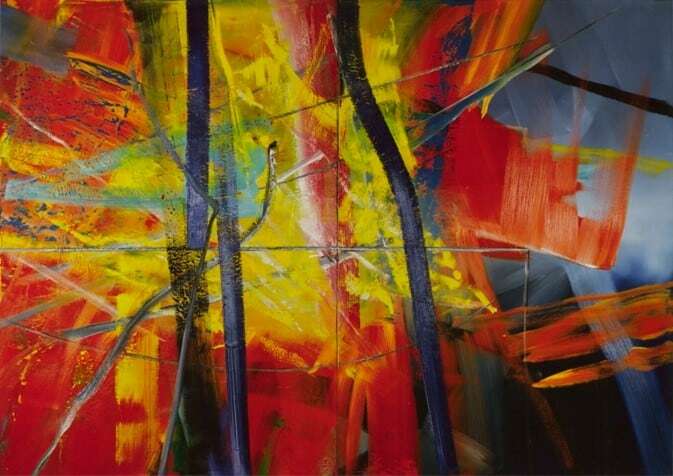 The painting’s many layers, strokes, and scrapes of color may thus appear as “beautiful” as anything found in nature that came into existence partly according to a predetermined structure (such as DNA), as well as by way of unpredictable occasions of pure chance and the action of outside forces. 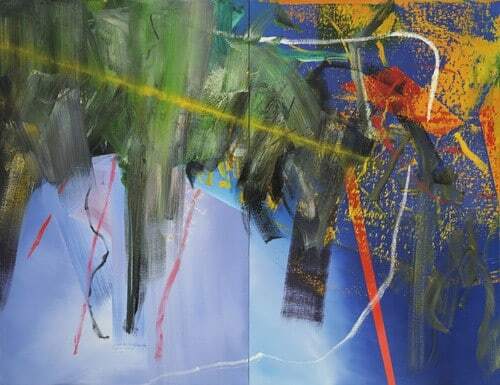 Richter has been the recipient of numerous distinguished awards, including the State Prize of the state North Rhine-Westphalia in 2000; the Wexner Prize, 1998; the Praemium Imperiale, Japan, 1997; the Golden Lion of the 47th Biennale, Venice, 1997; the Wolf Prize in Israel in 1994/5; the Kaiserring Prize der Stadt Goslar, Mönchehaus-Museum für Moderne Kunst, Goslar, Germany, 1988; the Oskar Kokoschka Prize, Vienna, 1985; the Arnold Bode Prize, Kassel, 1981; and the Junger Western Art Prize, Germany, 1961. He was made an honorary citizen of Cologne in April 2007. 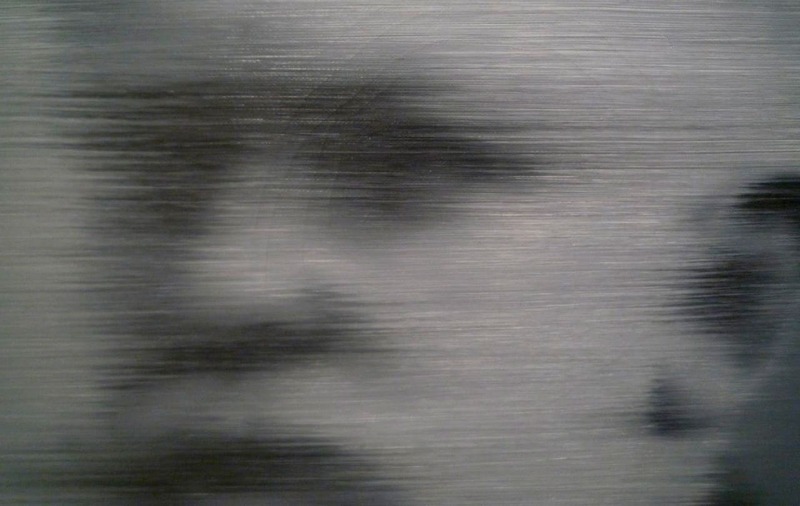 Gerhard Richter was born to Horst and Hildegard Richter in Dresden on February 9, 1932. Having married the year before, Gerhard was their first child, with a daughter, Gisela, arriving in 1936. Horst Richter, with whom Gerhard did not have a close relationship, was a teacher at a secondary school in Dresden. Hildegard was a bookseller and, like her father, a talented pianist. She was passionate about literature, and passed on her enthusiasm and knowledge to the young Gerhard. They were, in many respects, an average middle-class family. In an interview with Robert Storr Richter described his early family life as “simple, orderly, structured – mother playing the piano and the father earning money”. In 1935, Horst was offered a post at a school in Reichenau, then a part of Saxony, now Bogatynia in Poland. The family duly moved to the town, which was much smaller and less stimulating than Dresden. While living there was to prove much safer than being in Dresden when the war began, it perhaps marked the beginning of a gradual deterioration in the relationship between Horst and Hildegard. The strain was increased when Horst was conscripted into the German army. He left to fight first on the eastern front and then on the western front where he was captured by the Allied forces and detained in an American prisoner of war camp until the end of the war. In 1946 he was released and returned to his family, who by now had relocated from Reichenau to the even smaller Waltersdorf, a village on the Czech border. On his return, Horst’s reception was not as warm as he might have hoped. Commenting on this many years later, Gerhard explained: “He shared most fathers’ fate at the time… Nobody wanted them.” In an interview with Jan Thorn-Prikker in 2004 he added: “[We] were so alienated from him that we didn’t know how to deal with each other.” Although he seemed to have held neutral political opinions, Horst’s former membership of the National Socialist Party – an organization that all teachers had been obliged to join – made it virtually impossible to return to teaching. He worked for a while in a textile mill in nearby Zittau before finding a post as an administrator of a distance learning program for an educational institution in Dresden. Gerhard’s own memories of his early years are a combination of fondness and frustration, sadness and excitement. While his family left Dresden when Richter was only three years old, he recalls the house in which he was born in Grossenhainer Strasse, and in particular the house of his great-grandmother “not far from the original Circus Sarrasani building, where as a young lad I could see the elephant stalls through the cellar windows. My great-grandmother’s sewing box, made of armadillo skin. A man falling from a ladder – something that, according to my parents, only I had seen”. Little is documented about Gerhard’s memories of Reichenau, though his recollections about his time in Waltersdorf are more vivid, not least because when they moved to the village, he was already more than ten years old. He has been described as “a highly gifted child but notoriously bad in school” with Dietmar Elger noting that “he even brought home poor grades in drawing”. He dropped out of grammar school in Zittau and attended instead a vocational school, where he studied stenography, accounting and Russian. In addition to not enjoying school, he felt he didn’t really belong in Waltersdorf. He recalled, “We had moved to a new village, and automatically I was an outsider. I couldn’t speak the dialect and so on.” Like most boys of his age, he was obliged to join the Pimpfen in 1942, an organization for children that prepared them for the Hitler Youth. Fortunately, he was just a little too young to have been conscripted to the army himself during the last year of the war. Despite living in the countryside, Gerhard’s experience of the war was nonetheless intense. Apart from economic hardship and the absence of his father for several important years in his development, his family did not escape personal loss, with Hildegard’s two brothers, Rudi and Alfred, both being killed in active service. “It was sad when my mother’s brothers fell in battle. First one, then the other. I’ll never forget how the women screamed.” Hildegard’s sister Marianne also encountered a regrettable end to her life: suffering from mental health problems, as a result of the eugenics policies of the Third Reich she starved to death in a psychiatric clinic.